In the quiet of early morning, I ask my mom to come help me check whether the pastry dough for the Chinese curry beef pastries is too thick. 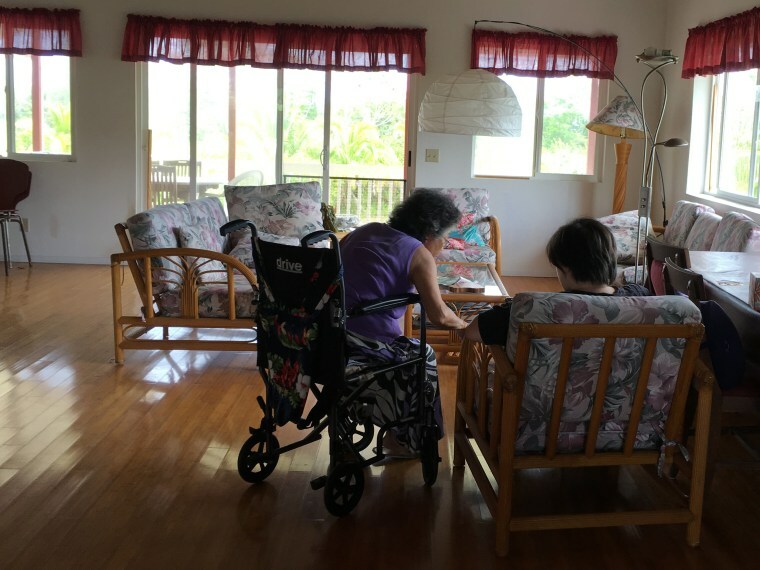 I push her wheelchair out to our big kitchen work table where our family has made many dumplings, pastries, breads, cakes, and cookies together over the years. My mom declares the dough thin enough, I roll it a little thinner anyway, and then I start cutting the pastry into circles with a rice bowl and placing the rounds on the table in front of her. Without discussion, my mom automatically begins to stuff the curry beef filling I had made into the pastry shells, her arthritis not a problem for hands so practiced and sure as they crimp the edges of each pastry into beautiful little ripples. A dozen pastries later, after I separate an egg and brush each pastry with egg yolk, my mom teaches me how to sprinkle sesame seeds onto each pastry. I know how to sprinkle sesame seeds. But I let her teach me. For the first time ever, it does not irk me that she thinks I do not know how to do anything. Right now, there isn’t anywhere I would rather be or anything else I would rather be doing. My mom is sick, and I am lucky to be able to be home taking care of her. You don’t get this time back. Then I realize that it is August already, and time passes so fast. Aug. 5 will be the fifth anniversary of the mass shooting at the Sikh Temple in Oak Creek, Wisconsin, by a man with reported ties to white supremacist organizations, killing six people and injuring several more. I am always so impressed by the incredibly generous response of the Sikh-American community to commemorate this day and these individuals with blood drives, feeding the hungry, community outreach, and volunteer efforts across the country. This year, I am particularly moved by the stories about a son who, five years later, is still flying to Oak Creek once a month to take care of his father who was paralyzed in the shooting. Although we remember the one day, it is too easy for some of us a little further away to forget how the impact continues for the individuals and the families every day. I have the tiniest sense of what that caretaking might be like, but only because my mom is sick right now. I think about how sometimes you simply have to be there, with your hands — reaching out a hand to steady her, testing the water with one hand to see if it warm enough, scrubbing the house to her standards (impossible). Phone and email are not enough. As my mom slowly recovers, I am “stress cooking” every day, trying to trick my mom into drinking more liquids with different soups, trying to sneak more protein into her, figuring out food that will counteract the harsh medicine she is taking, making her take her medication with food every six hours, on schedule. My mom says that the chicken with sticky rice dish I made actually tastes good. First compliment ever. Everything else in the world feels so far away right now. The day that the Senate votes on health care repeal happens to be the long day that my mom and I are travelling by plane, taxi, and wheelchair through two airports, an unfamiliar city and hospital, and back again. My mom lives so far out in the middle of nowhere that her health insurance sends her on an airplane to her state’s biggest city for anything requiring a serious hospital. As I shepherd my mom from one doctor and one test to the next and then the next, trying to keep track of room numbers and multisyllabic medicine names, I am so grateful that she has health insurance. My phone, however, has different ideas and continually beeps at me all through the day about the news from Washington, pulling me back into the world. It is at this level that we are all the same, trying to take care of our families, our children and our parents and others. This is where health insurance and hate crime laws are supposed to work so that we can focus on the important work of taking care of our loved ones. This is where privileges like education and money help a lot. This is why those of us who can have to keep advocating for all our communities. Some nights, I sit in my mom’s room in the dark while she sleeps, just to sit with her.